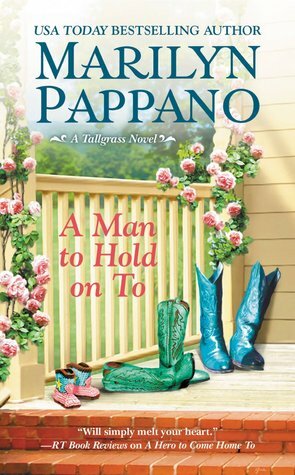 A Man to Hold on To is the second book in the Tallgrass series by Marilyn Pappano. I liked the first one so decided to listen to the audio of the second one. We were introduced to Therese and her stepchildren in the first novel. Therese belongs to a group of women who meet regularly - they have one main thing in common - they all lost their husbands in war. Therese has battled to connect and love her stepchildren, but they have been resistant and at times downright rude. We meet them as again as they return from a visit from their mother. What? You might ask - why aren't they with their mother full time? Good question - however Therese does have custody, and I know if I was either one of the children, I know who I would rather be with. Into this situation walks Keegan with a youngster - almost three. Mariah and she calls him Sally's boy - she has been taken care of recently by her grandmother - Keegan's mother. This has been going on since the mother dumped Mariah on them. One of the delights of this book is when Keegan is enforced to spend a couple of weeks in Mariah's company. He finds his heart opening up to her. Mariah also scores a hit with Abby and Jacob - the horror children. Or are they such horrible kids? I suspect their behaviour would be quite typical of children who have lost a father, find their own mother doesn't really care for them, and they are stuck with a stepmother. I read a review of this book where the reader was sorry that Therese didn't score over Abby in the book. Yet as Therese kept reminding herself - she was the adult! And a very good one too. The book also keeps us in mind of Jessie, another war widow, who has a problem with drinking and can end up drunk in anyones bed - and she isn't doing too well at work either. She had such a one night stand with Dalton in the last book, and it looks like now this could be going somewhere. The narrator, Loretta Rawlins did a competent job of narrating, and I will be quite happy to listen to the next one in this series as an audiobook if she is narrating. I enjoyed the story, and the characters. I hope we hear a little more of Therese and her family in the next book. Great review Kathryn. This sounds like it has plenty of complications to keep it interesting. Yes it was Pat - I did enjoy it and the audio added rather than detracted for this book. I'm intrigued by the complicated relationships! Sounds like one I'd enjoy.